The boil advisory for the Highland Park area is now lifted. Sealed Bids for the Turtlecreek Road Sanitary Sewer Extension Project will be received by the Village of South Lebanon at the Village Municipal Building, 99 High Street, South Lebanon, Ohio 45065, until Tuesday, August 28, 2018 at 10:00 a.m. local time, at which time bids received will be publicly opened and read. In general, the project consists of the installation of 1,460 feet of sanitary sewer and 5 manholes along Turtlecreek Road north of Mason-Morrow-Millgrove Road in the Village of South Lebanon. The free electronic Bidding Documents which include plans and specifications may be obtained by contacting the issuing office of the Village of South Lebanon at jhaddix@southlebanonohio.org or at (513) 494-2296. Hard copies are available for an additional $20 non-refundable fee. For additional information regarding the project, please visit the website www.southlebanonohio.org. The Village will not be responsible for full or partial sets of bidding documents, including Addenda if any, obtained from sources other than the Village of South Lebanon. The Contractor shall be required to pay not less than the minimum wage rates established by the Department of Industrial Relations of the State of Ohio. No Bidder shall withdraw his Bid within 60 days after the actual opening thereof. The Village of South Lebanon is seeking candidates for the full-time position of Sewer Specialist. The successful candidate must have completed high school or equivalent with a minimum of two (2) years of previous experience in construction, maintenance and repair of wastewater and stormwater systems or equivalent training and/or experience. The complete job description may be viewed at www.southlebanonohio.org. Application available at the South Lebanon Municipal Building,99 N. High Street, South Lebanon, OH 45065 8:00 a.m. to 4:30 p.m. M-F or online at www.southlebanonohio.org . Application deadline is 4:30 p.m. on August 10, 2018. The Village of South Lebanon is seeking candidates for the full-time position of Tax Assistant. The successful candidate must have completed high school or equivalent, preferably with an Associate’s Degree in accounting or related field, and a minimum of (1) year of experience in municipal tax collections or equivalent training and/or experience. The complete job description may be viewed at www.southlebanonohio.org. Applications available at the South Lebanon Municipal Building, 99 N. High Street, South Lebanon, OH 45065, 8:00 a.m. to 4:30 p.m. M-F or online at www.southlebanonohio.org . Applications must be received by 4:30 on Friday, August 3, 2018. Keep up to date on the latest South Lebanon news and events as well as receiving periodic newsletters about happenings in the Village by simply clicking here to subscribe to the Village’s email list. You will receive an email re:public notices, meeting notices, and many other items of interest. If you have any questions or comments, please contact the Village at (513) 494-2296 or by email at jhaddix@southlebanonohio.org. Notice is hereby given that the Village of South Lebanon has passed Ordinance No. 2018-9, in the matter of implementing Sections 3735.65 through 3735.70 of the Ohio Revised Code, establishing and describing the boundaries of a Mixed-Use Community Reinvestment Area (CRA) in the Village of South Lebanon, designating a Housing Officer to administer the Program, creating a Mixed-Use CRA Housing Council and a confirming the duties of the Tax Incentive Review Council. Ordinance 2018-9 along with the map can be downloaded at the link below. It is also available for review at the Village of South Lebanon Offices, 99 North High Street, South Lebanon, Ohio 45065 weekdays from 8:00 a.m. to 4:30 p.m. For additional information, interested parties may contact Nicole Armstrong, Fiscal Officer, at 513-494-2296 or at narmstrong@southlebanonohio.org. Sealed Bids for the sale of Village-owned property on Turtlecreek Road will be received by the Village of South Lebanon at the Village Municipal Building, 99 High Street, South Lebanon, Ohio 45065, until Tuesday, July 31, 2018, at 10:00 a.m. local time, at which time bids received will be publicly opened and read. In general, the project consists of the sale of a 5.001 acre Village-owned parcel located on Turtlecreek Road between Interstate 71 and Mason-Morrow-Millgrove Road (Parcel No. 12-01-102-001). The Village of South Lebanon Annual Water Quality Report (Consumer Confidence Report(CCR)) for 2017 as required by the Safe Drinking Water Act is now available. Click here to view the CCR report. Please see following flyers for information regarding Back to School Supply Drive and Back to School Event held by Warren County Children Services. Direct any questions you may have to Misty Treadway. 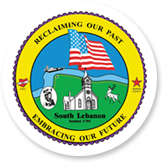 The Village of South Lebanon is requesting sealed Statement of Qualifications from professional engineering firms for the purpose of providing professional services for the design of new water and sanitary sewer lines for the Village of South Lebanon. The project involves the design of approximately 11,200 lineal feet and gravity and force main sanitary sewer, combined, and the design of a sanitary sewer lift station for the Village of South Lebanon, Ohio, to serve the area of the Village south of the Little Miami River. Also, the Village is seeking professional services for the design of approximately 2,250 lineal feet of new water main. Statement of Qualifications documents may be obtained by contacting Jerry Haddix, Village Administrator, at jhaddix@southlebanonohio.org or by visiting the Village of South Lebanon website at www.southlebanonohio.org . Submissions will be accepted until 4:00 p.m. on June 8, 2018, at the Village Offices, 99 North High Street, South Lebanon, Ohio 45065.